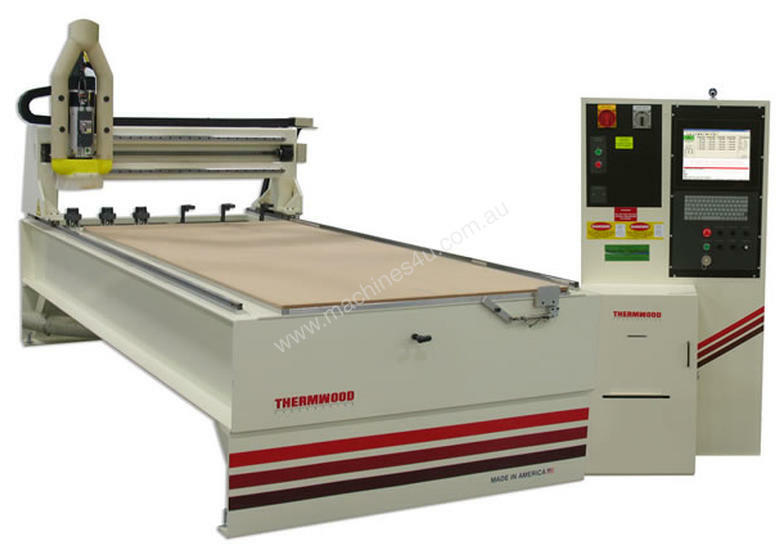 Thermwood - Model 41 - 3 axis flatbed nesting CNC router. The CS41- 48 machine is a complete nested based CNC routing system for machining cabinet boxes, custom furniture and support products. It is a moving gantry with fixed table, CNC router. All 3 axes are equipped with high efficiency ball screw drives providing feed rates up to 30M per minute. This machine was designed using advanced 3D software utilizing Finite Element Analysis. All major weldments including the base and gantry are stress relieved to provide long term stability. This machine is inspected and calibrated utilizing a precision volumetric laser system. Volumetric compensation measures the exact X, Y and Z position of the cutting head within the working envelope and compensates all three axis at each position for any error. All linear axes ride on precision ground and hardened trackways with precision bearings. The machine base and bridge structures are heavy duty weldments designed to provide long term performance and reliability. The machine base is configured with steel mounting pads and levelling bolts. High performance closed loop Siemens AC Servo drives equipped on all axes. The Thermwood Gen2 SuperControl is feature rich, high performance CNC control system configured to perform 3 axis simultaneous motions. It is a Pentium P4 3.0 Ghz processor, full multi-tasking control. It features a high level of hardware integration, extensive use of reliable surface mount technology and a built in upgrade path for future technology. The control is equipped with a 15" full colour LCD flat screen monitor, 83 key 101 emulation QWERTY keyboard, 250 GB SATA hard drive. It also includes a serial port for hand held programmer interface, variable 0 to 120% feed rate override and operator controls for start, stop, axis jog +, axis jog -, block step +, block stop - and feed hold. The control provides PCI buss expansion slots and is compatible with most Local Area Networks (LANs) as well as a variety of peripheral computer devices. The control uses a "Windows" XP Pro operating system, offering the operator choices for program and machine operation display, pop up windows for event and information display, pop up windows for data input, and the ability to operate the machine in the background while doing other tasks on the control. Compensates for positional variations within the three dimensional working envelope of the machine. Allows the user to mechanically locate three points on a fixture during initial program set up. These points establish future fixture locations. This feature is very useful when the fixture cannot be precisely located on the machine bed after each use. •	Solid-state memory and control system, fully diagnostic. •	Thermwood’s one year limited warranty. Includes one year of Advanced Support and one year of Virtual Service. Virtual Service provides direct, live, visual contact from the machine control to Thermwood’s Service department. •	An analogue, POTS-style phone line to the machine control is required when using Virtual Service Dial-Up. •	An Ethernet connection to the machine control and an Internet Service Provider are required when using Virtual Service High-Speed. •	Ability to combine multiple jobs in a single nest. •	Label printer support to print labels for each part at the machine. •	Sheet printer support to print detail nest diagrams at the machine. •	Automatic trim of reusable material to remove unusable protrusions. •	Full control of minimum size part to save for future use. •	Bar code labelling of reusable drops for easy input in new jobs. •	Simple bar code scan to add drops to a new job. •	Full ability to edit and delete jobs and items from nests. •	Easy ability to replace scrapped parts in the next nest. •	Software is to operate and runs right on the CNC control. •	Manually input size and shape of any material then nest it. •	Input location of defects then nest around them. •	Runs DXF output from major CAD and Cabinet Design Systems without the additional interface or software. •	The Profile Modeller offers the ability to machine profiles generated using the Job Level Interface output from capable design software. Profiles can be machined by using a combination of tools, such as in modelling, or by using a specific custom tool through the Custom Tool selection function. •	1220mm wide by 2440mm deep stationary steel table. The table top is equipped with integral spacers to allow for maximum vacuum flow. •	Table equipped for vacuum hold-down. Includes a single high-flow plumbing port with single on/off control. •	The 2BH series regenerative vacuum blower's light weight, and the compact design allows for operating in close quarters. The 2BH has an operating capacity of 129 CFM and can achieve an end vacuum of up to 20" Hg. The cool running outboard bearings increase service life. This vacuum system is both oil free and maintenance free, and nearly noise free, operating at a low noise level of 70 dB(A). •	For use in locating flipped parts into a predetermined machine location for secondary machining operations. •	One (1) 10 HP, 3,000 to 24,000 RPM programmable variable speed router mounted to a servo controlled Z-axis. •	Six (6)- position Combination Bar Style Automatic Tool Changer – Three (3) positions have a maximum tool size is 50mm diameter and 75mm length and three (3) positions have a maximum diameter of 60mm diameter and 75mm length. •	Includes pre-set tool holder fixture and dust hood. •	An assortment of router bits selected especially for the Cabinet Shop CS41 machine and your application. •	Control mounted sheet and label printers for part identification. Printer system accepts information from eCabinet Systems and DXF files using Control Nesting. •	Hand held reader allows user to read an existing bar code and automatically loads the correct corresponding part program to be executed. •	Automatically provides continuous lubrication to the rail bearings and the ball followers on the screws. •	Provides direct, live, visual contact from the machine control to Thermwood’s Service department. Diagnose, troubleshoot and configure the control remotely with a certified Thermwood service technician. •	Communication features available between the operator and the Thermwood Gen2 Supercontrol allows the operator to electronic search the programming and maintenance manuals, view maintenance videos, error reporting, maintenance tracking, and dynamic exploded assembly drawings. •	CNC router programming training (5 days) for 2 students. Training classes are conducted at Thermwood's training facility in Dale, Indiana. Customer is responsible for travel and lodging expenses.